The Institute of Transportation Engineers (ITE) Trip Generation Handbook has become the predominant method for estimating vehicle trips generated by development. The handbook is often criticized for its inability to account for multimodal behavior in urban contexts, often overestimating vehicle traffic. The purpose of this research is to develop and test a ready-to-use method for adjusting the ITE handbook vehicle trip generation estimates for urban context. This method was created using household travel surveys from Oregon, Washington, and Maryland, as well as nationally available built environment data. Three adjustments were estimated for eight general land-use categories, including a “pooled” category considering all travel survey data. The performance of three adjustments were tested using 195 establishment-level vehicle trip generation datasets compiled from three independent sources. Using this data, the performances of four land-use categories were tested. The overall findings suggest that the simplest of the three adjustments developed provided similar results to the more complex adjustment methods. Moreover, adjustments applied using the “pooled” land-uses category also provided similar results to the more detailed segmentation of travel survey data. Both of these findings punctuate the need for a simple, urban adjustment for trip generation estimates. Currans, K. M., & Clifton, K. J. (2015). 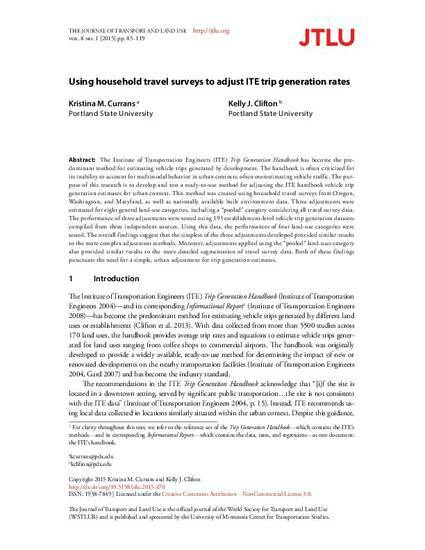 Using household travel surveys to adjust ITE trip generation rates. Journal of Transport and Land Use, 8(1), 85-119.